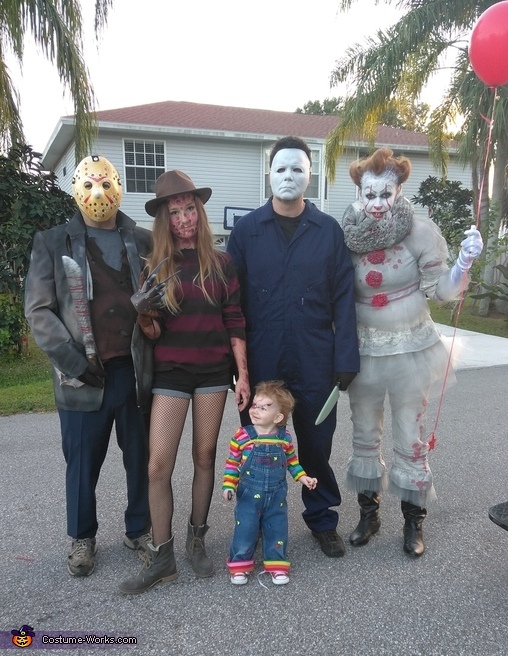 We always do family themed costumes. Last year we were the wizard of Oz. This year my 13 year old (freddy krugar) chose the theme, and I just went with it!! I am pennywise from the movie IT, I purchased a cream colored top and a skirt from Goodwill and went to town. I made the skirt into pants, added tulle to ever ruffle, slary painted grey and a little black to make it look dirty and added fake blood.And the collar is made from coffee filters! The hair is my origial all natural red hair, that I teased and hair sprayed like crazy to create a clown look and I did my own face paint, putting some white in my hair as well to create the look of his high forehead. And of course I added some fake teeth and a res balloonn! My daughter, Freddy krugar, did her own makeup! Using multiple colors to add demension. We found her too at wlamart in the little boys isle, ripped it up a bit and spray painted some black to make it look dirty. My husband, Michael Myers, was easy. We bought some work coveralls and a mask for him. My fathers (aka Grandpa, aka Jason) outfit was also purchased at Goodwill. I ripped up the sweater and also used a sport coat, because I couldn't find a regular coat I liked, pulled out the lining, ripped the seams, cut some holes, and spray painted it as well for the dirty effect. And last but not least, My younger daughter, Chucky. I used some hand me down bibbers, and hand painted "Good Guys" on the front, then hot glued little toy trucks to mimic Chucky's bibbers. I cut the bottom portion of her shirt off and used it to make the cuffs at the bottom of her legs. I did her face paint and she also has red hair so we just put a little gel in it. We had a blast teick or treating, and were stopped by many people asking to take photos with us.